Amazing freestyle drawing by Korean comic book artist Kim Jung Gi. Described as an artistic savant, his ability to draw complicated scenes from memory without the aid of references is his most notable asset, stretching the boundaries of what many artists believe was possible. Although his comic books and sketchbook series have garnered him critical acclaim, his live drawing demonstrations are something to experience. As the video illustrates, fully formed ideas seem to fall from his head onto paper and each part of the drawing was pieced together as if it already existed. The difference between me and most other artists is that they try to draw things from looking at reference and copying what they see. I try to look at live objects and study them in front of me. I draw from real life. By doing that I become more capable of remembering them afterwards. Ever since I was little, when I watched movies I would go back in my mind and draw what I remembered and what I liked from the movie, as an interpretation of the movie or a comment, if you like. I have a very good memory. 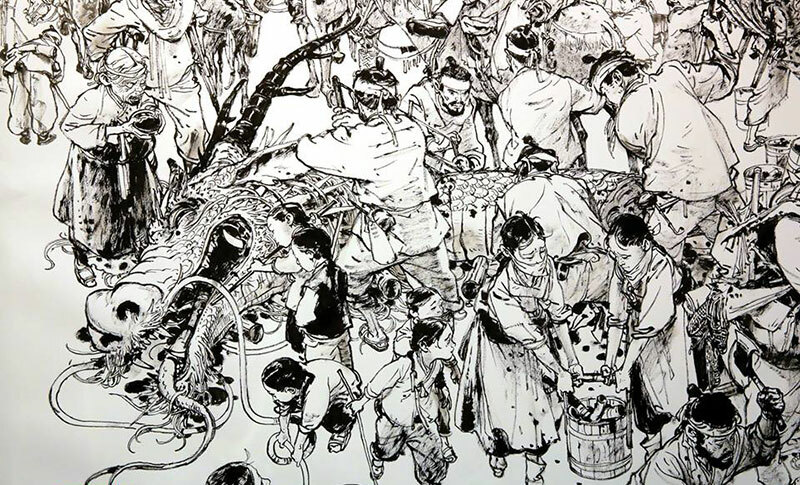 Amazing freestyle drawing by Korean comic book artist Kim Jung Gi.